We recommend removing all rubber parts ( float needle ( Fig. D) and float bowl gasket (Fig. C)) and spraying all internal portions of the carb body with carburator cleaner. On an excessively tarnished carb, remove all parts and soak the body in Acetone for 24 hours and clean with carb cleaner afterward to disolve the gas residue. as the size of this hole is critcal to the function of the carb. It is advisable to replace carb top, bowl (Fig. 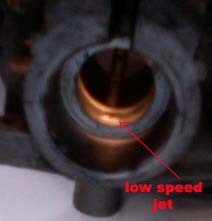 C) and fuel banjo gasket as well as the float needle on all carb cleans ( main jet (Fig. B) also if beyond cleaning). Parts are again listed at http://www.mopedjunkyard.com/dellorto-carb_c_430.html and are DC-008, DC-015, DC-016 (D), DC-019 and DC-023. If the needle seat ( Fig A.) 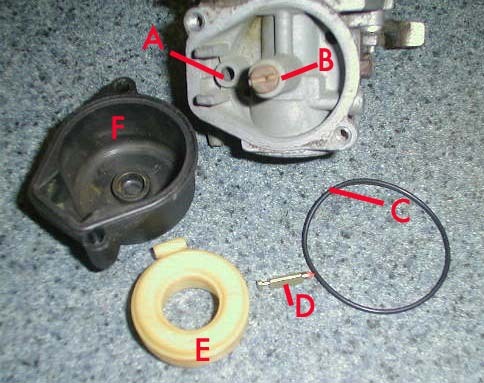 is pitted or worn (this is part of the carb body ) it may be necessary to replace the complete carb (TM-036)as the fuel flow will no longer regulate and the moped will tend to flood.